Why can’t vegetables be plentiful and yummy all year long? I don’t know, but I intend to enjoy them while they’re around. 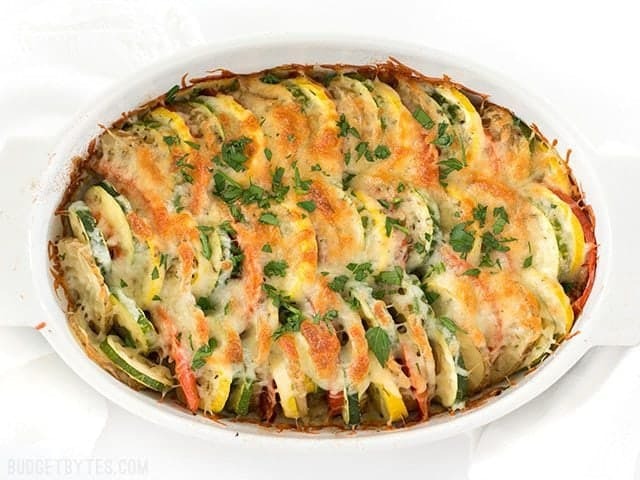 This Summer Vegetable Tian is the perfect easy side to showcase the medley of delicious vegetables the summer has to offer. I like to enjoy the natural subtle flavors of vegetables. I’m not all for frying or smothering with thick, rich sauces, but sometimes I want something a little more. 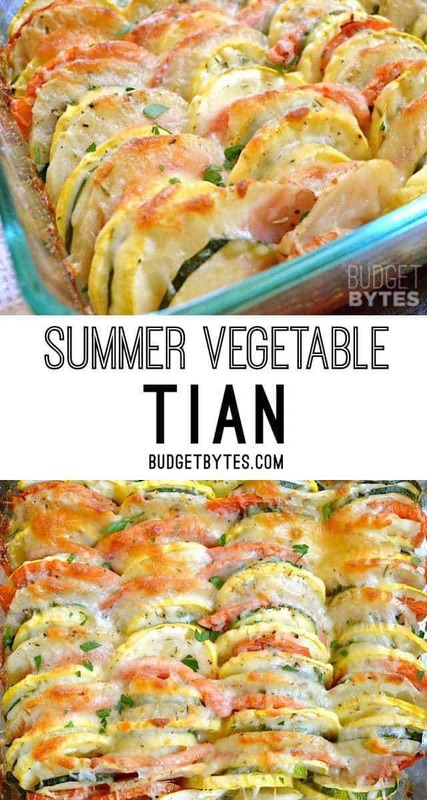 This Summer Vegetable Tian lands half way between both worlds. 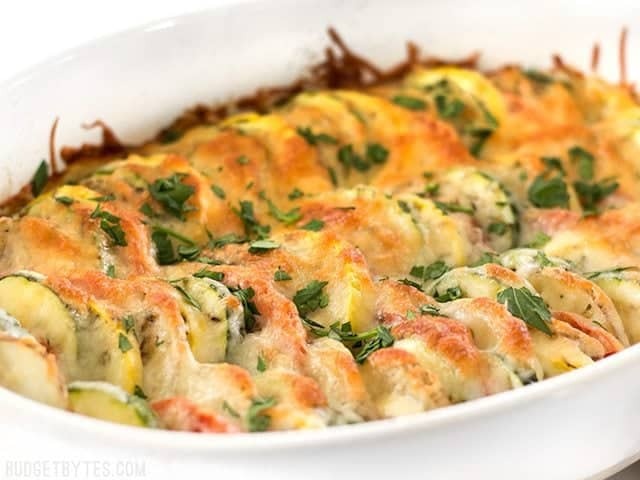 The vegetables are sliced thin, seasoned only with a little salt, pepper, and thyme, and then topped with just a small amount of flavorful cheese. 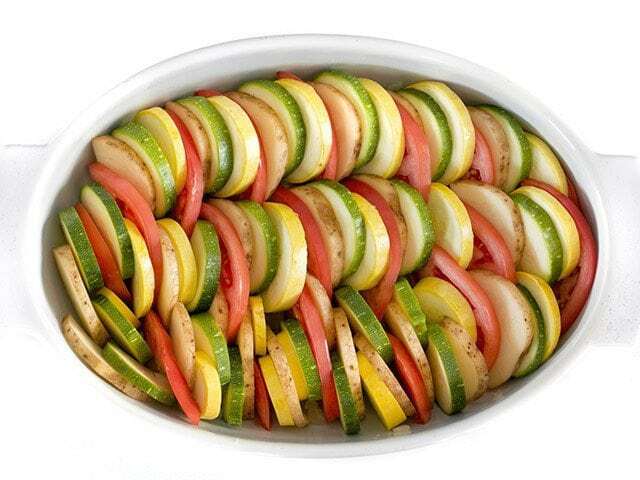 Roasting the vegetables magnifies their flavor and gives them just a hint of sweetness. 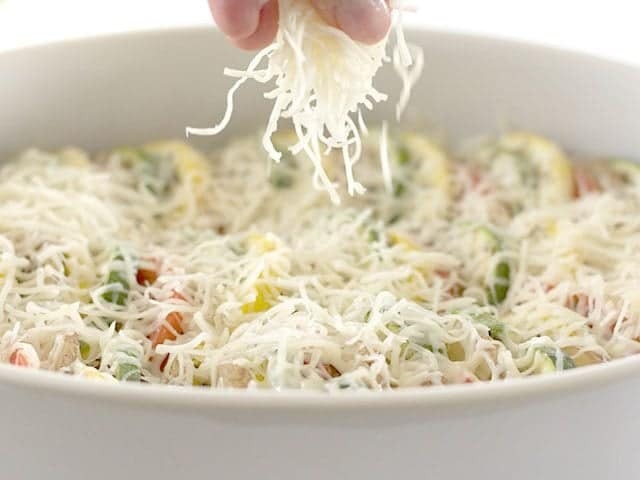 It’s veggietastic. Creamy cheeses work really well with this dish but I happened to have a four cheese Italian blend on hand so I used that. 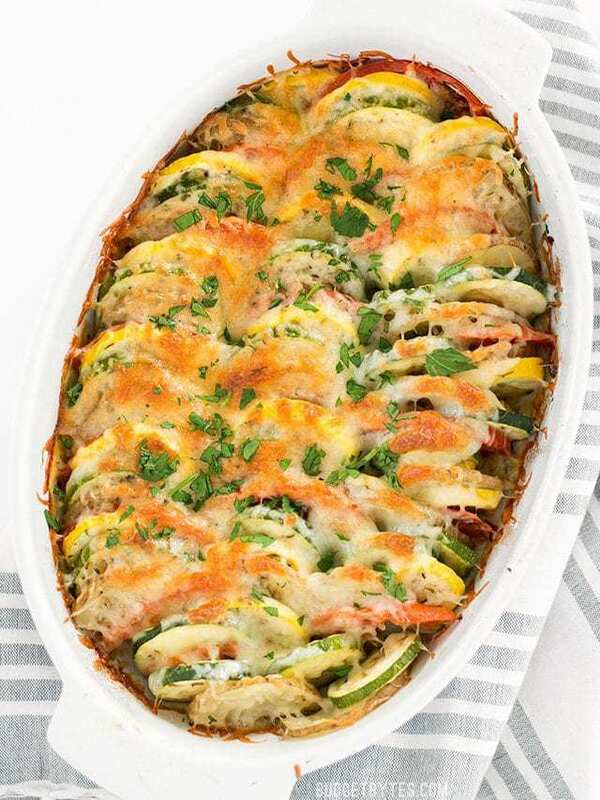 Fresh summer vegetables and savory herbs are layered together then topped with cheese before baking to perfection in this summer vegetable tian. 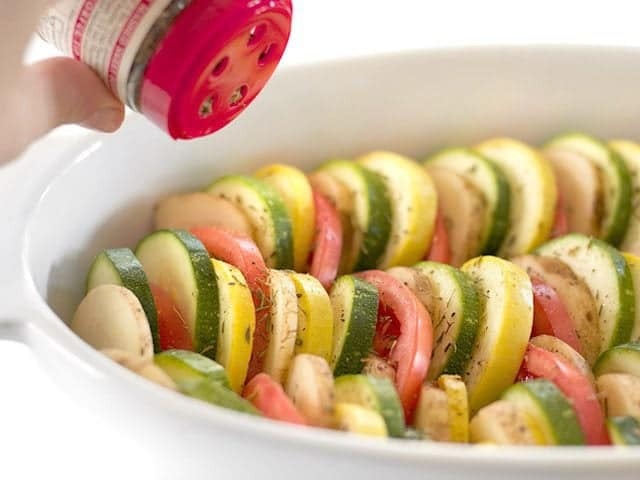 While the onion and garlic are sautéing, slice the zucchini, yellow squash, tomato, and potato thinly (1/4-inch slices). 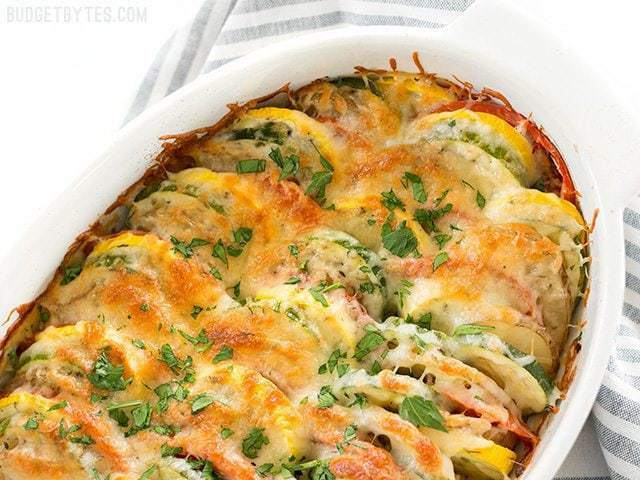 Make sure the potatoes are very thin so that they soften quickly while in the oven. Coat the inside of an 8x8" casserole dish with non-stick spray. Spread the sautéed onion and garlic in the bottom of the dish. 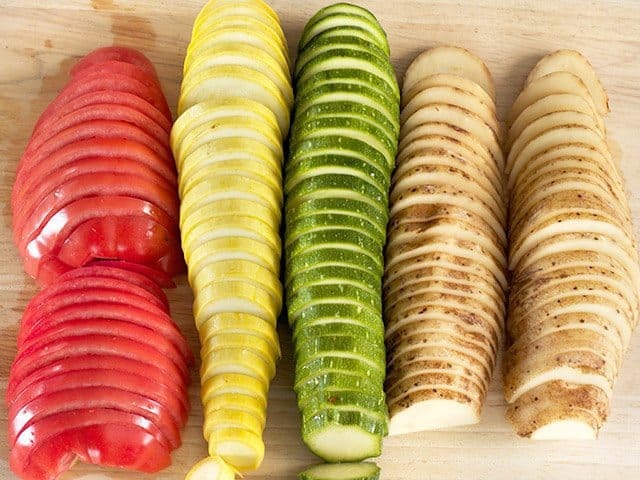 Arrange the other sliced vegetables, stacked vertically like dominos, in an alternating pattern. Season the top of the vegetables generously with salt, pepper, and dried thyme. Begin by preheating the oven to 400ºF. Dice one yellow onion and mince two cloves of garlic. 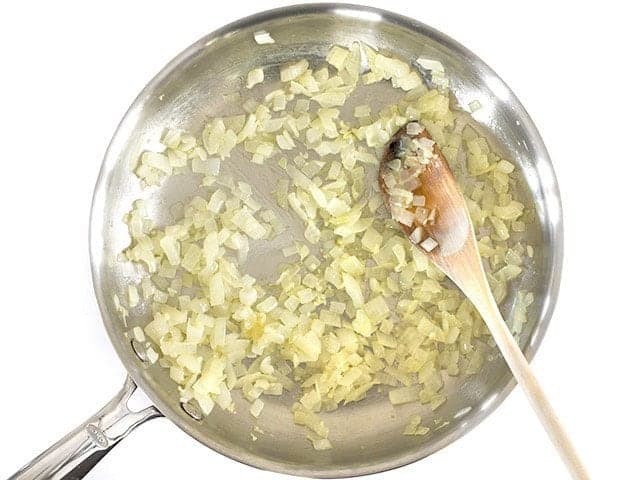 Sauté the onion and garlic with 1 Tbsp olive oil in a large skillet over medium heat until soft and transparent. 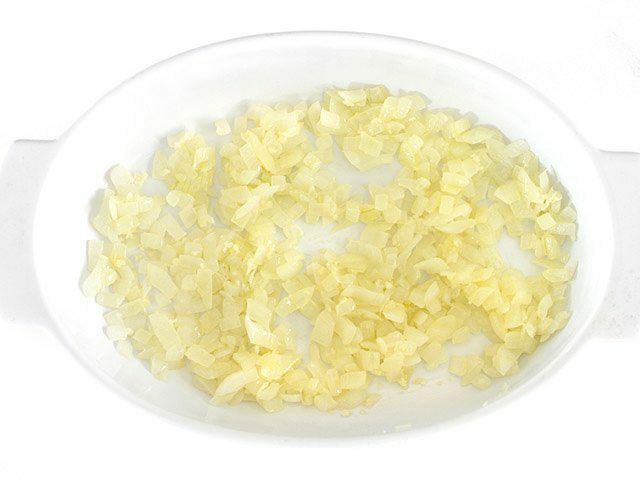 Place the sautéed onion and garlic in the bottom of an 8×8 (or similar size) casserole dish. 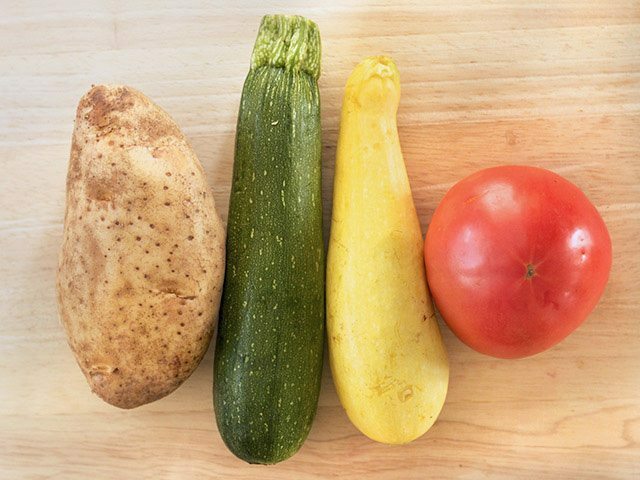 Wash one potato, zucchini, yellow squash, and tomato to remove any dirt or debris. 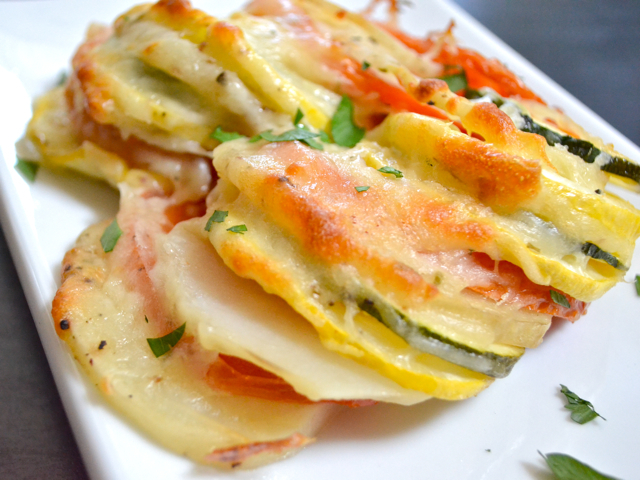 Slice the vegetables into 1/4-inch thick slices. The tomato and potato had very large diameters compared to the squash, so I cut them in half before slicing to make them a more similar size. 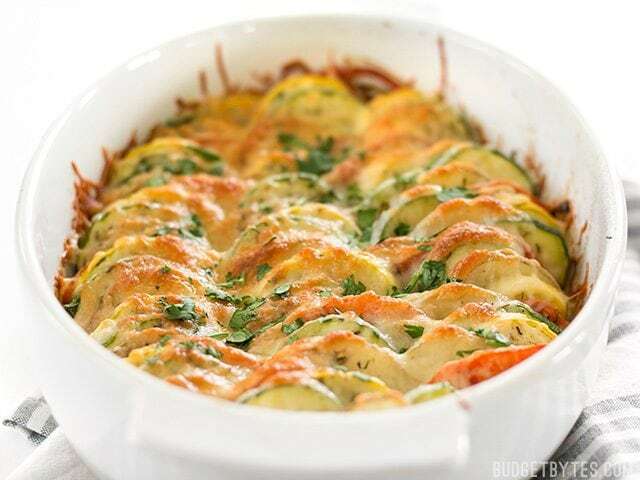 Layer the potato, zucchini, yellow squash, and tomato in the dish over the onion and garlic in an alternating pattern. It doesn’t need to be pretty, just squeeze them in there any way you can. Season the top of the vegetables generously with salt, pepper, and dried thyme. Cover the dish with foil and bake for 30 minutes in the preheated oven. 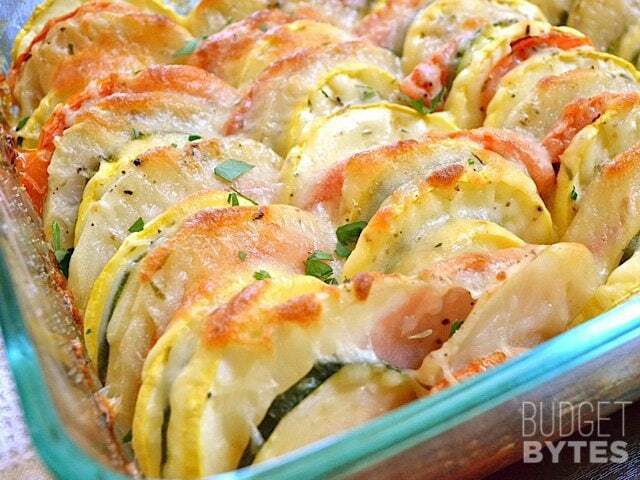 After baking for 30 minutes, remove the foil and top with about 1 cup of shredded Italian blend cheese. 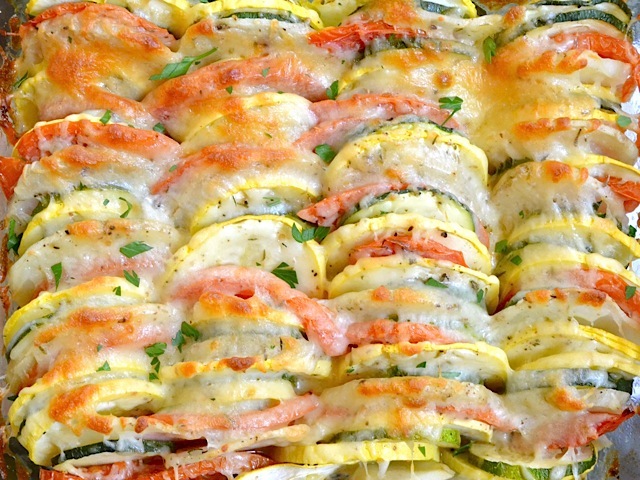 Return the Summer Vegetable Tian to the oven (without the foil) and continue to bake for another 15-20 minutes, or until the cheese is melted and golden brown. Top with a little fresh chopped parsley for garnish, if desired. Have done this many times and it’s awesome each time! But I’m wondering if I could use red potatoes instead? The potatoes always take so long no matter how thin I try and chop them. Thanks in advance! I add sweet potatoes and portobello mushrooms. This one of my family’s favorite dishes! We don’t use foil in our household, any suggestions for the first part that uses something instead of foil? We are trying to reduce our waste. Could I add sliced eggplant to this as well or do you think that will that ruin it? Well, “ruin” would probably be a subjective interpretation. :) I don’t think it would be terrible, but without having tried it, I’m not sure what texture the eggplant will be after roasting with these other vegetables. If they stay moist, I think it will be good. If they dry out it may cause a more leathery texture.